It began as our mission to create skilled workers and gain access for Therapy Dogs within the community. It soon became our passion. The first time you see your dog working, how they understand the ‘human’ condition, you begin to understand our logo. Dogs have ‘something’, a power over the human spirit that just can’t be explained. Through Kindred Souls Canine Center LLC, we were the first to design a Therapy Class and through Chris Lehmann we became involved with Bright and Beautiful Therapy Dogs. Therapy class is offered to Kindred Souls graduates of the schools Basic Obedience. Pre-Requisite: Basic Obedience and Evaluation. Kindred Souls Canine Center was one of the first in New Jersey to offer this course in preparation for obtaining Therapy Dog Certification. 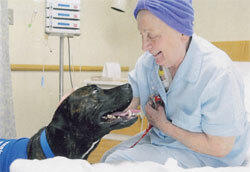 We strive to create Therapy Dogs who are not only stimulating companions but highly skilled workers. It has always been our belief that with greater training these dogs will be allowed increased access to facilities that would benefit from this type of program. The course consists of a combination of desensitizing exercises and upper level command training. Our dogs leave this course ready to handle any public situation with a controlled and appropriate response. The therapy Class is run by trainer Christian Luke Lehmann and assisted by his dogs “Rosie and Spencer”. Spencer (rest his soul) was Chris’s special dog who loved his Therapy Work and was at Chris’ side throughout the development of KS Therapy Corp. Chris is also the Regional Director for the Bright and Beautiful Therapy Dog organization which he has been a part of for many years. Chris has been a major force in organizing and promoting the work of Kindred Souls Canine Therapy Corps. Having mastered every aspect of Therapy training, Chris is also available for PRIVATE THERAPY TRAINING, to overcome trouble spots. You can contact Chris at (732) 730-3444 or at Foxnsocs@aol.com For times and dates of Therapy classes. Kindred Souls Canine Center is proud to have certified over 450 dogs for “Bright and Beautiful” in the last 6 years. These dogs and their handlers are in many ways pioneering areas in Therapy Work previously unchartered. We have held our dogs and their owners to a higher standard of expectation and they have forged their way into serving the public in previously off-limits areas such as Oncology Hospital Units and Kindred Souls “Read to a Dog ” reading program at a local municipal Libraries (both Monmouth and Ocean Counties). 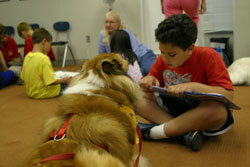 Our students raised the bar in defining what a Therapy Dog is by meeting not only the requirements of the test,. but by taking their training further to include additional behaviors in the dog, allowing the dogs to cope with pretty much anything in a calm and most importantly controlled consistant way. This is our chance to set an example, and through the creation of Kindred Souls Canine Therapy Corps and the support of the Bright and Beautiful organization, we hope to create and maintain a level of soundness and control in our dogs that make their work truly innovative and meaningful. The ability to handle the unexpected is the hallmark of Therapy work and is a learned response. This is what sets our dogs apart………what we teach and what they absorb. They are taught to be model citizens in public by taking them through a multitude of exercises, above test requirements, to prepare them for their service work.